The above photograph is apparently the face-lifted 2013 Mercedes E-Class sedan. The image is posted by Victor Guti�rrez Poza on Spanish car website, Autofacil. According to Mr Poza, the photo graph is taken from his hotel room in Chamartin in Madrid, Spain. The photograph does look legitimate and seemed to be taken from a hand phone camera as the resolution is not very high. As evident from the image, the most significant update is the headlight combination, which is now a single piece and seemed to borrow its styling cue from the smaller C-Class. 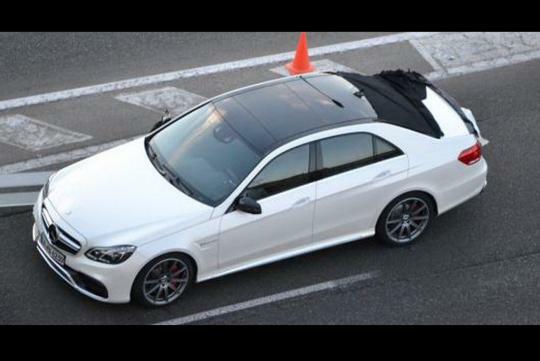 From the huge alloy wheels, red brake calipers and large air vents on the front bumper, this spied model could very well be the E63 AMG version. There are some wordings on the front fender as well although they are not very clear on the photo. The new grille is more elegant and sporty and I hope that the design will be applied to all E-Class variants, not only the AMG model. The embossed Mercedes logo adds a touch of modernity to the Towkay�s all-time favorite sedan.